Mistake or no mistake, he has lent his rich baritone voice to an omnivorous array of songs. 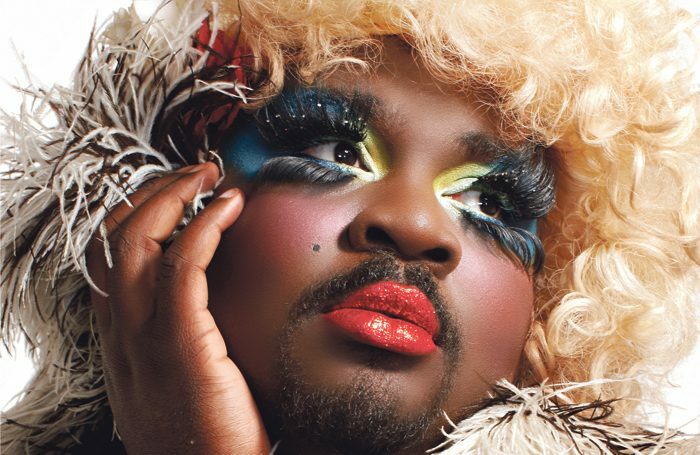 Whitney, Wagner, Purcell, Porgy and Bess, he’ll sing them all – in fake eyelashes, a wig and lycra that highlights all the curves that men aren’t ‘supposed’ to have. But it’s not just cabaret that this bearded drag diva lends his voice to (and that’s probably why he works so much). 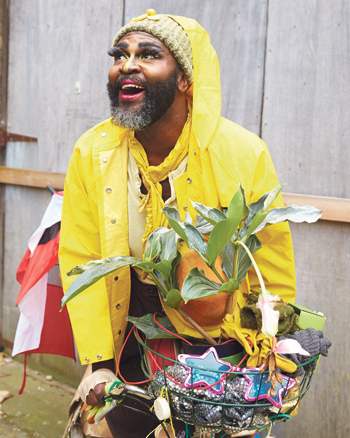 The gigs at La Clique, La Soiree, and the Glory are punctuated with his solo shows Black, Icons, and Duckie, and work as an opera singer – most recently in The Threepenny Opera at the National Theatre. It’s an attitude that comes from entering a world not through training, but through sheer – slightly frightening levels of – chance, graft and talent. After moving to the UK(where he was born) from Nigeria as a teenager, he boarded at a grammar school, where his love of singing was encouraged. But he had to give up a place at Guildhall School of Music and Drama in favour of reading law at the University of Sussex, after his funding plans fell through. The Brighton club scene, specifically a club night called Dynamite Boogaloo, initiated him into a rather less precious style of vocal entertainment. These are themes that resonate through his 2013 solo show Black – a look at depression and loneliness that culminates in a heartbreakingly drawn-out performance of I Wanna Dance With Somebody (Who Loves Me). It’s a piece that tarnishes the shallow gleam we’re taught to expect of drag queens, and juxtaposes the camp chaos of Friday nights out with the tough reality of Monday mornings back at a job you hate (in his case, as a call centre agent at NHS Direct). What was your first non-theatre job? Working in customer services for Lloyds Bank. What was your first professional theatre job? Peter Pan at the Lighthouse Theatre, Poole. What do you wish someone had told you when you were starting out? You are enough, you have the job. Work hard and excavate to the nub of who you really are and what unique selling point you can offer the work. Be inspired by, but not envious of, your contemporaries – that’s a waste of time and energy. Instead, focus on your progress – do all of this, strive to evolve always knowing and believing that you are enough. What’s your best advice for auditions? Prepare, breathe and be honest. Breathe to calm yourself, enabling you to deliver and showcase the particular skill set and talent you can offer. Don’t serve the panel or the auditioner, serve the intention of the piece, author or composer. If you hadn’t been a cabaret performer, what would you have done? Maybe opera, full time. I’m very thankful for the current balance between theatre, cabaret and opera. In an alternate universe, one I’m grateful isn’t my reality, I’d be a lawyer, but fantasising about being a performer. Do you have any theatrical superstitions or rituals? Not really. Prepare, warm up and trust that the work you’ve done is enough, that you are enough. It’s a pretty huge task – one man in a lycra leotard taking on a whole system that enshrines the importance of having lighter skin and fitting in. But it centres on tearing down the mythology of the beautiful swan that The Ugly Duckling teaches us we’ll become one day. After all the heavy stuff, it’s easy to see why he’s delighted at the prospect of flying to Australia with A Night at the Musicals, his show with fellow drag queen Jonny Woo. “It’s a show that’s born out of our friendship, and it captures a real joy and anarchic abandon – what made it ignite the way it did is its ability to completely forget everything for one hour and have fun with two grown men in bathing suits.” And in-between ripping the piss out of the silliest bits of musical theatre, he’ll be mugging up on Chekhov: the Young Vic in London has just asked him to perform in The Bear/The Proposal. With a tour of Black in the works, too, it’ll be a busy 2017. But it’s nothing on December 2016, when he did three shows a day all month (two performances of Duckie in the day, and Icons in the evening). Or 2008, when he took two flights a day so he could simultaneously perform in a show at Edinburgh by night and rehearse an opera in London by day. The Bear/The Proposal runs at the Young Vic, London, from March 15-25.